One of the basic seasonings of Japanese cuisine; shoyu is made by fermenting soybean mash using saltwater, osmophilic lactic acid bacteria, and yeasts. The process may take over a year. Shoyu as it is known today was first made in Japan in the Muromachi (室町 むろまち) period (1333-1568). There are a number of types of shoyu, distinguished according to the ingredients used and the length of the fermentation process. The widely used koikuchi shoyu (濃い口醤油 こいくちしょうゆ) is fermented for a longer time and is darker in color and somewhat heavy in texture; usukuchi shoyu (薄口醤油 うすくちしょうゆ) is fermented for a shorter period, is lighter, but saltier. People tend to use different types of shoyu in different parts of the country. In general, people in the Kanto area and in the north like koikuchi shoyu, while people in the Kansai area prefer usukuchi shoyu. 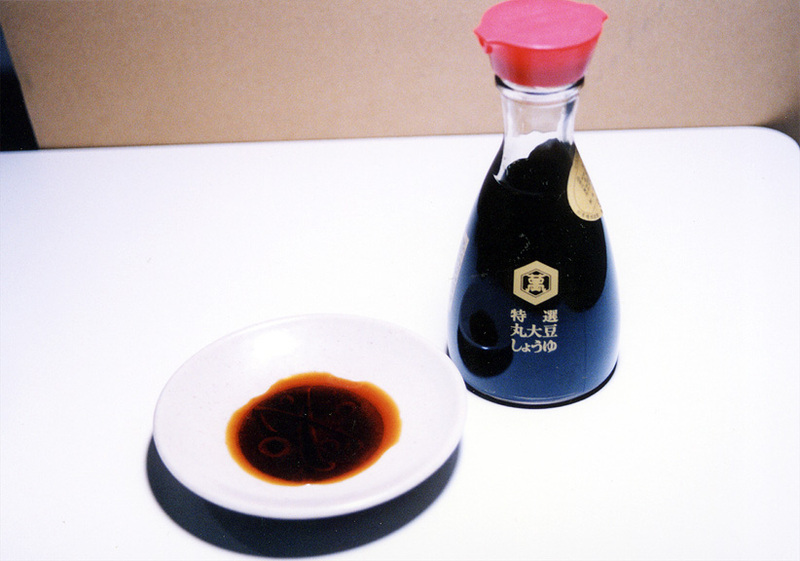 The two types of shoyu are used for defferent purposes in cooking, as well.